Do You Need Electrical Help? We’re on call 24/7 for your electrical emergencies. We can help you with electrical problems and any other related service. Your friendly neighbourhood electrician is here to save you! 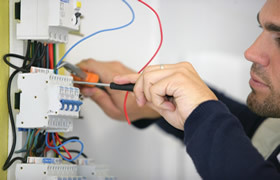 Providing expert commercial electrician services and repairs. 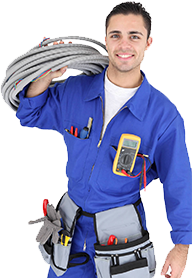 Aktiv Electrical provides a cost-effective service in electrician Seven Hills electrical installation, repair, and service. Seven Hills is primarily a residential area, with solid homes, large yards and plenty of lawn mowing to be done. Solid established homes age over time and it’s important to maintain the overall wellbeing of the home. Locals within the area are also friendly and social, with neighbours regularly asking one another for advice and recommendations on certain electrical issues or service professionals. We take pride in being your local Seven Hills electrician because not only does the owner of Aktiv Electrical live in Seven Hills (so he could be your neighbour) and understands the area, but the advice and solutions we can give you can save you hundreds of dollars in the long run. For us, your Seven Hills electrician is like a member of your family that is always needed. Our extensive service area means we can send our domestic or industrial electrician to the Blacktown, Parramatta, and Penrith areas. We are also your local electrical contractors in Seven Hills, Castle Hill, Baulkham Hills, North Shore, all within a 15km radius. There are many reasons why you might need a Seven Hills electrician to come to your home. Maybe you’re moving in/out, and you’ve obstructed an outlet. Maybe you’re renovating your home or commercial property. Or maybe you’re with friends and suddenly the electricity or TV goes out. Not to worry. At Aktiv, we put the customer first. That’s why we vow to arrive on time, work efficiently, and do the job according to industry safety standards. Our Seven Hills electrical contractors make time to listen to your requirements to ensure they are providing the highest standard of service and will work in a way that causes minimal disruption to your home or office. This dedication to customer satisfaction means our local Seven Hills electricians have maintained long-lasting relationships with many of our clients, who value our attention-to-detail, quality workmanship and the competitive prices we provide. We’re available 24 hours a day, 7 days a week and just around the corner from you. At Aktiv Electrical we understand that cost is also a big factor especially with the rising expenses people struggle with on a daily basis. That’s why our quotes are as accurate and detailed as possible. Also, speak to us about our referral discount once you are satisfied with our electrical work. To get the best industrial and domestic electricians in Seven Hills working for you, contact us by calling 0400 818 595 – or fill in an online enquiry form to have us get back to you as soon as possible. If you have an emergency electrician need, simply call for our 24-hour emergency service. Mature Knowledgeable sparky. Work output is always of the highest standards and labour is quite reasonable. He is on my speed dial for any electrical work or advice. Thanks Joseph 😊✌. Keep the good work going. Top quality work. Extremely good, reliable service. No job too big or small. Punctual. Prices are reasonable. Will go the extra mile to provide the service that is required & needed. Very happy customer. Easy communication, turned up on time, does a thorough job, and prices are very reasonable. Would definitely recommend! Prompt professional services, job explained clearly and the best is the very competitive charges. Highly recommended !